You never know when this tip from Kiri Osenkov might come in handy – how to investigate why Visual Studio keeps rebuilding before running, even when you think nothing has changed. 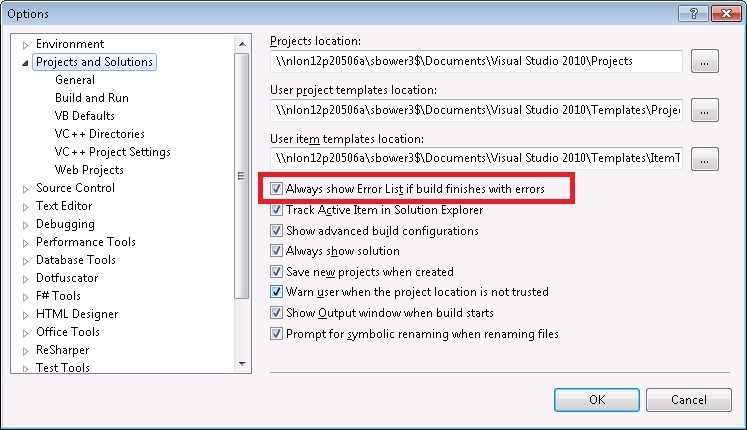 One of my least favourite features of Visual Studio 2010 is that every time my build has an error, it pops up the Error List window. And every time, I switch to the Output window to read the full compiler error because the Error List doesn’t show enough information. In terms of interaction, that’s a major context switch – I’m focussed on the Output window looking at compile errors then BANG, the Error List interrupts my train of thought. The remaining question is: why put this option under “Projects and Solutions” instead of under “Build and Run”? I’m currently attending ACCU2013 at Bristol and saw Jonathan Wakely’s presentation on SFINAE (Substitution Failure Is Not An Error) this morning. This is a traditional SFINAE example using type traits. true_type and false_type just need to have different sizes, then we can use function template specialization to differentiate between two cases. So if I instantiate Decorator with Widget, it compiles (because Widget derives from WidgetBase), but instantiating with Bodget yields a compiler error (because Bodget does not inherit from WidgetBase). This code all compiles with recent versions of gcc (e.g. 4.7). Under Visual Studio, only the traditional example compiles (default arguments for function templates are not yet supported, neither is aliasing, not even with the Nov ’12 CTP). Today I took a look at some Online C++ compilers – this would have been very useful when checking portability of some code in my recent post on C++11 Concurrency. I’ve written some C++11 concurrency code in VS2012 with the November CTP and wanted to test if it would also run on Linux compiled with gcc – hence the effort to upgrade my laptop over the last couple of days. The upgrade worked fine – I’m quite impressed with Linux Mint and with CodeBlocks. Unfortunately, gcc 4.7.2 has left me disappointed. Looking on the bright side, gcc 4.8 should be along soon and I’m sure the support for std::thread and lambdas will be working by then. In the meantime, I’ll be hanging out with VS2012 Nov CTP. I’m a big fan of C++11 and the new features that have become available, including move semantics. However, our team found today that a code optimization which worked under VS 2005 was causing memory corruption under VS 2010. CDeepCopy was used as the key into a map. For large data sets with heavily overlapping key values, this was inefficient because each lookup would entail the cost of a copy constructor – this was particularly expensive due to the heap operations. As an optimization, the following technique was used to avoid the copy constructor call in the event of an update operation, yet worked correctly if the operator() call led to an insertion. This code worked as intended in VS2005. However, compiled under VS2010 we were seeing memory corruption in the final case (the one with the unnamed temporary). After some debugging, we realised that under C++11, std::map has an operator( KeyT&& key ), that is the key is an rvalue reference – and this form is called for our unnamed temporary case. That avoids calling our CDeepCopy copy constructor, and so the key in the map can be left referencing deallocated memory. A simple workaround prevents this happening again – declare CDeepCopy( CDeepCopy&& ) as private but omit the definition – this means that the unnamed temporary usage does not compile. Here’s some code that tries out C++ 11 delegating constructors. These were announced as part of Visual Studio in the November CTP and avoid the need to refactor common code out of constructors into an “init” function. There are examples of their use in Stephan Levavej’s excellent video series too. << "Request( Priority priority, const std::string& requestId ) called: "
<< "RequestId " << m_requestId << ", "
<< "Request( const std::string& requestId ) called: "
// because the delegating constructor succeeded). As with other Nov CTP features, Visual Studio intellisense hasn’t caught up yet, so expect to see red squiggly lines all over the code if you try this out. What’s interesting is that it’s now possible for ~Request() to be called if a constructor fails to complete, as long as the delegatee (inner) constructor does complete.